You know, I was hitting a wall with my Artisan project from last night. So, I decided to switch modes to the monthly My Paper Pumpkin challenge. I held up the wooden veneers and thought... "goodness, that's a nice tag". Then I thought about why I would congratulate someone. 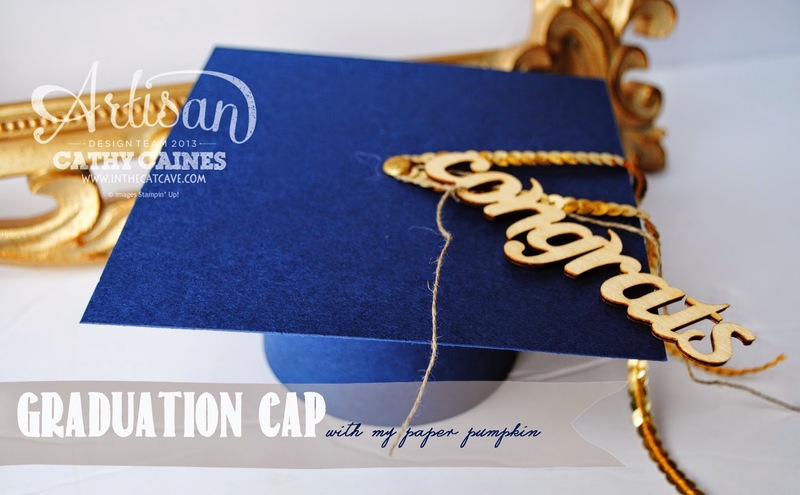 And five minutes later... with a tad of the gold sequin trim secured with a glitter brad... we have a cute little graduation cap! Now why can't inspiration happen like that more often? Make sure you join the challenge with us!! My Paper Pumpkin monthly kits are getting better and better. Check out the video below for next month's Paper Pumpkin!! Now that's thinking outside the box Cathy!